Two passengers with HIV are suing a budget Chinese airline for refusing to let them board a plane. 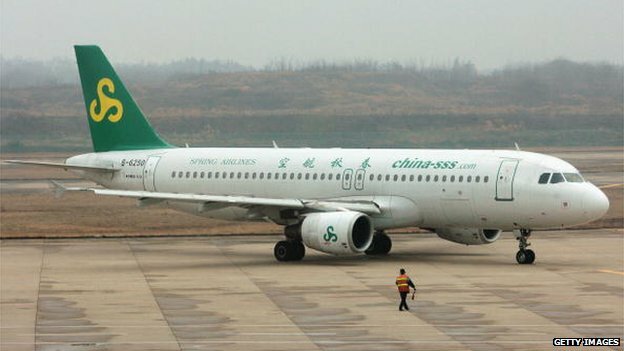 Local media reports say the two men and a friend – who does not have HIV – were prevented from boarding a Spring Airlines plane at Shenyang airport. The airline’s president Wang Zhenghua said on Tuesday that the company did not discriminate against HIV carriers, and blamed the incident on staff anxiety, according to the AFP news agency. But he also blamed the passengers, and said the firm would allow HIV-positive travellers to board their planes as long as they did not make themselves “overly noticeable” to avoid scaring other customers. Spring Airlines’ website states that it has the right to refuse passage to those with “infectious diseases”. An airline spokesman told Caixin that since the incident, the airline has not turned away any HIV-positive passengers. The passenger said they were unable to negotiate with airline officials, who terminated the three passengers’ tickets. They eventually took a train to their destination. That same year, a Chinese court ruled against a man who said he was denied a teaching job because he had HIV, in what was the country’s first HIV job discrimination case. This entry was posted in English and tagged Aids, China, china-sss, discrimination, HIV, Passengers with HIV, Shenyang airport, Spring Airlines by kiumars. Bookmark the permalink.